In the summer of 1977, I had a paper route delivering The Daily News in the Bronx to almost 100 customers, many of them older. One of them was Mr. Norton, a tough-talking grizzled New Yorker who frequently sent me to the deli to get him a six-pack of beer. He was a shut-in and an avid reader of The News, so when the papers started to pile up outside his door, I grew alarmed. It took a while, but I finally got the attention of the security service that patrolled our buildings and was there when the officers broke into his apartment. In what was an appalling lack of discretion, the officers asked me – a 12-year-old — to come inside and identify his dead body. Mr. Norton was on his back on the floor, his face a frozen grimace. I remember it distinctly to this day. That was one of several events that summer that yanked me from my protected cocoon of school and home and forced me to confront the realities of death, violence and the ugly side of human nature. Up to that time my exposure to death was fleeting. I had lost a grandmother and a grandfather, neither of whom I knew very well. But that summer taught me that death could be immediate and unpredictable. It saw the continuation of the reign of terror of the Son of Sam, a serial killer who used a .44-caliber handgun over a year to kill six and wound seven. I was too young to date or drive (he targeted young couples in cars) but the idea that some madman was killing people at random was hard to comprehend. Even more disturbing was a young couple on my paper route who had a toddler son. Outwardly nothing seemed amiss but one day the husband apparently snapped and killed his wife, their son and himself with a large knife. The brutality shocked me but I was even more upset by the disconnect between how I perceived him and the reality of what must have been going on behind closed doors. 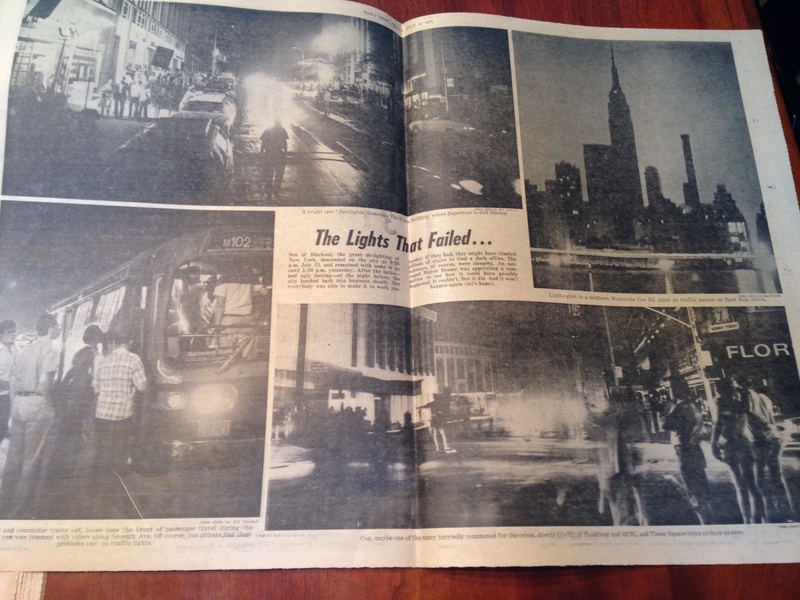 And then there was the citywide blackout of July 13–14, 1977. Plenty of neighbors helped each other and people banded together during the crisis but that kind of altruism was eclipsed by arson and looting that felt like something out of an apocalyptic movie. Though my neighborhood was spared the worst of that property damage, I recall feeling disappointed and confused that people could act that way. Coming of age – when you cross from childhood into young adulthood and your worldview is reshaped – conjures up movies such as “The Breakfast Club” (1985) or “Stand By Me” (1986). But my coming of age did not happen in after-school detention or with a bunch of buddies on a trek to see a dead body. 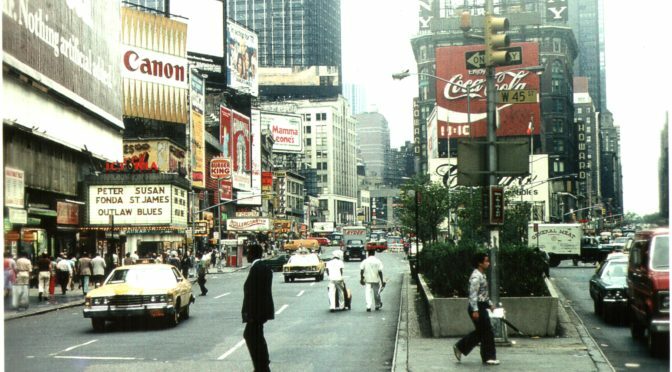 Real life – not Hollywood – burst my insulated bubble that summer 40 years ago. My Pollyannaish ways became a thing of the past. Each generation shares some moments in history that leave an indelible mark, and everyone alive at the time can recount where they were and what they were doing. Where were you when John F. Kennedy was shot? When the space shuttle Challenger blew up? During 9/11? For me, one of those moments was: Where were you when the lights went out? 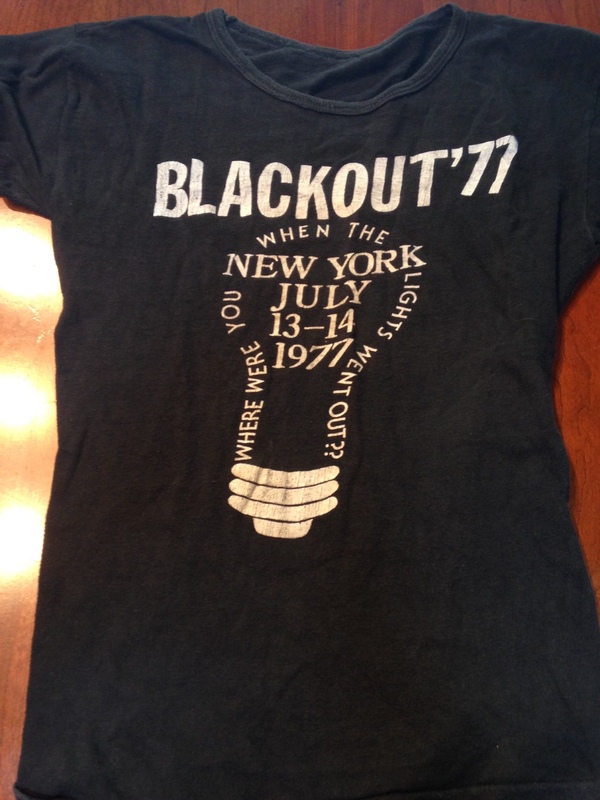 I am not talking about the blackout of 1965, or the one in August 2003, in which some 50 million people in Southeast Canada and eight Northeastern states were without power for as much as two days in what turned out to be the biggest blackout in North American history. 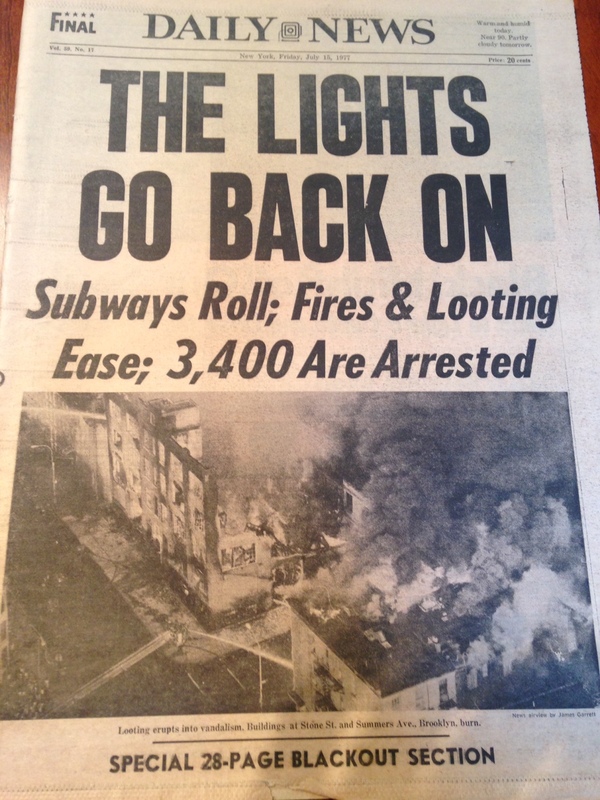 While that was terrible — 11 people died and there was a reported $6 billion in damages – the blackout that stayed with me the most happened 40 years ago this week. 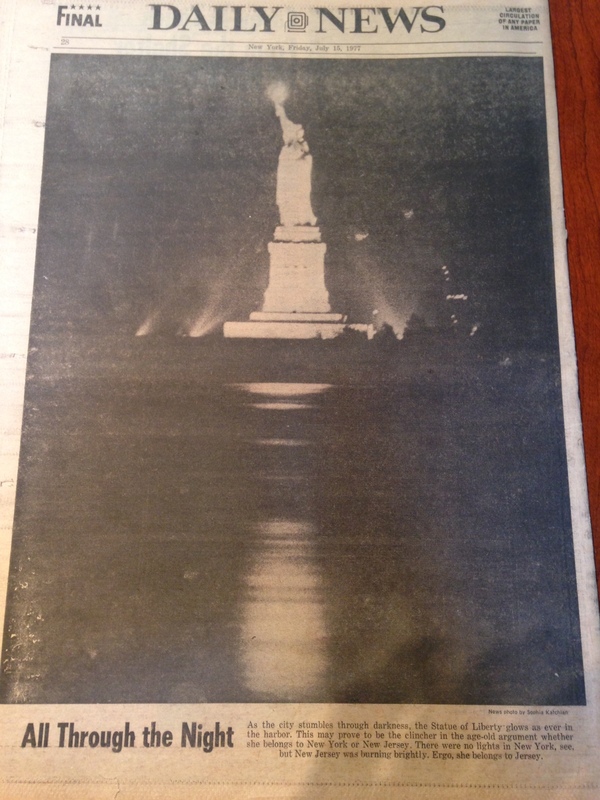 It was the evening of July 13, 1977, and New York City was enveloped in oppressive heat and humidity. Our third-floor apartment was like the inside of a brick oven. We had no air-conditioning. The fans did little more than loudly move the hot air around. I was getting out of the shower when the lights went out. I thought we had blown a fuse. It turned out the entire city blew a fuse — a really, really big one. It was bad enough that there was no power to keep the fans – as ineffective as they were – blowing, but we soon discovered we were out of water too. Our building in the Bronx had a tower at the top. Water would be pumped to the tower and gravity-fed to the apartments. People lined up at open hydrants and formed bucket brigades, filling pails and carrying them back home to “flush” toilets. I checked on my older customers on my newspaper route to make sure they were OK.
Hallways and stairwells were as dark as midnight in a coal mine. They lacked windows so no natural light got in. On some stairwells, small candles were lit like votives in a church. I recall listening to WINS news radio with its signature theme music. We gathered around my sister’s Toot-A-Loop, a Panasonic doughnut-shaped radio, and heard the updates about the violence, looting and arson racking the city. Fires consumed city blocks. In the end, more than 1,600 stores were damaged and more than 3,700 people were locked up. The city was at a nadir, having gone through a fiscal crisis that saw its public services slashed and quality of life eroded. 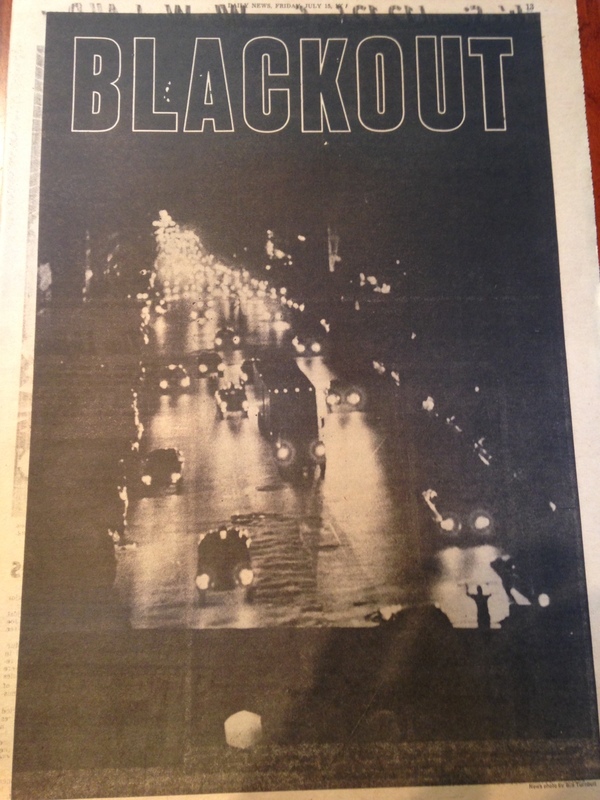 For a city that was already down on the canvas, the blackout was a kick in the mouth. But you know what? As bad as it was — and don’t get me wrong, it was bad — there was also an esprit de corps that emerged among New Yorkers. They rallied in a time of crisis. Strangers helped strangers as they had during blizzards and the way they would 24 years later during the Sept. 11 attacks. Civilians took to intersections to direct traffic where signal lights were out, freeing up cops to do more important duties. Mr. Diamond, the owner of the Carvel ice cream store across the street, gave away ice cream. Neighbors checked on each other and offered flashlights and batteries. 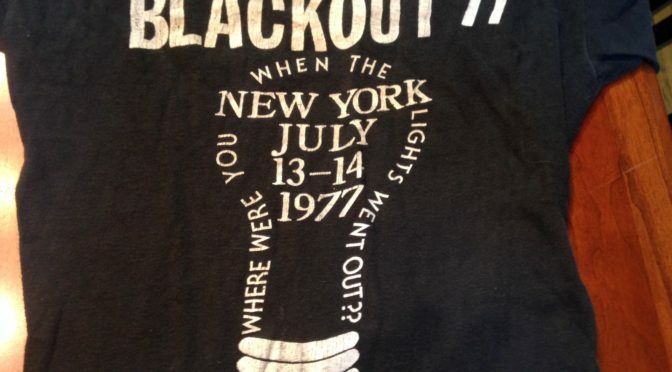 The blackout brought out the worst — and some of the best — in people. In the heat of the summer of 1977, the mettle of New Yorkers was tested and it was strong.